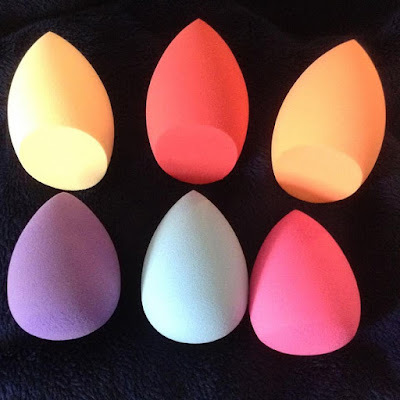 My daughters are in love with these makeup sponges so I had to find more at a good price to make everyone happy including getting myself a new set. Even my 9 year old wants one and she doesn't even wear makeup, she just knows the other girls love them so that should mean she wants one too. Funny how children think. I love that this set comes with 3 full eggs and 3 eggs with a flat side. I love the flat eggs for getting near to my eyes, lips, ears etc, while the full eggs are used all over my face and neck. Very soft to use on your delicate facial skin. Remember to wet your sponge so it does not soak up so much makeup that it is wasting it. You will see the sponges are bigger and soften once used in the right way. When I told my daughter they are meant to be wet when used she was amazed and has said it made a big difference in how the product goes on, as well as using a lot less of her product to do the same job she was doing dry. The KAMOTA makeup beauty sponges can be found on my affiliate link below. Disclosure: MarksvilleandMe received one or more of the products mentioned above as part of a promotion with Tomoson and KAMOTA. Regardless, MarksvilleandMe only recommends products or services we use personally and believe will be good for our readers. Some of the links in the article may be “affiliate links.” This means if you click on the link and purchase the item, I will receive compensation. If you would like MarksvilleandMe to review a product or service please contact us at marksvilleandme@gmail.com.